But surely the whole point ‘Hide and Seek’ is hiding so well you are the last player to be found? If that is true then God plays ‘hide and seek’ very badly, almost as badly as Matthew. God is like a big over excited kid who can’t wait to be found, so he might hide behind the curtain but he leaves his big hairy toes poking out. Or he runs behind the sofa but makes sure he casts a shadow on the wall. 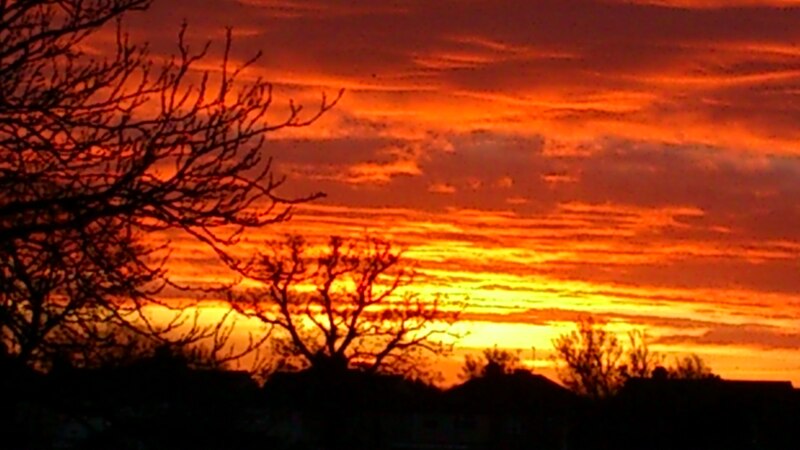 I took this photo this morning at 7.55am out of our back bedroom window. It was the sun rising over the houses at the end of our garden. An ordinary place and an ordinary day but an extraordinary display of beauty. Isaiah 40:22 says that God stretches out the heavens like a curtain. Well, God wasn’t doing much hiding behind the curtain this morning! The Bible also says ‘the Heavens declare the glory of God’ , but the evidence of that declaration is only there for those who choose to see it. Some will see it, just as a beautiful sunrise, a ‘trick’ of nature. And, granted, it’s not proof of the existence of God. But by the same token you could say ‘it’s an incredibly complex universe and that’s not proof of the existence of God’. Maybe so but it is an incredibly complex universe, about as unlikely to have simply evolved without a designer as ‘a tornado blowing through a junk yard would be likely to assemble a jumbo jet’. If there were indisputable evidence there would be forced compliance and how horrible would that be? We would have no choice (a bit like the citizens of North Korea). God is not a dictator who insists we believe but he is a creator who has left his finger-prints for us to find. And he is a God who longs to be found, who generously leaves hints and sign-posts that point to his presence. if you have eyes to see, you can find them in face of another human being, hear them in the giggle of a child, feel them in the warmth of the sun, taste them in good food, and find them liberally scattered through all creation. Or you can draw back your curtains on an ordinary Tuesday… and gasp! I was reading on another blog just now about how the early Christians expected Jesus to return soon and here we are over 2000 years later still waiting for the “Long expected Jesus.” This reminded me of a sermon I heard many years ago where the minister said that to often we are looking out of the bedroom window waiting for the stars to fall and the moon turn to blood when Jesus has just come through the back door and is waiting for us in the kitchen for a cup of coffee. In waiting for Jesus return let’s not miss him in the here and now. God bless and have a happy Christmas.